Woodhenge in Wiltshire is the latest mysterious Stone Age feature to engage the attention of archaeologists studying the Stonehenge UNESCO World Heritage Site. First discovered by an aerial photographer in 1926, it long took a back seat to its more intriguing neighbor, two miles distant. But now that so much has been discovered about Stonehenge, researchers are taking a fresh look at Woodhenge. The truth is, one really knows much. There are six concentric, slightly oval rings of posts, with the long axis pointing at the summer and winter solstices. 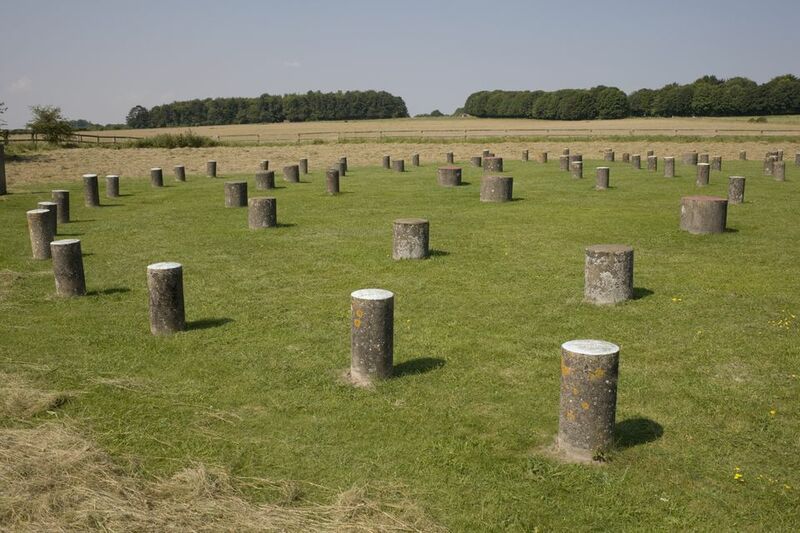 If you visit today, you will see a field full of posts, but these are simply concrete markers showing where the original timber posts would have been located. The original posts disintegrated long ago, leaving behind the shadows discovered by aerial photographer Squadron Leader Gilbert Insall, VC , in 1926. Before Insall's discovery, locals thought the field might have been an old burial mound or barrow with a surrounding ditch and bank, a manmade work of unknown purpose. But what the aerial photos revealed were concentric rings of dark spots in a field of wheat. Initially archaeologists thought they might be graves but on excavation they were found to be post holes. Were they the supports of a large, ritual building, partially roofed, where the timber posts were bigger, and open to the air in the center? Or maybe it was simply a field of standing timbers, a more primitive version of Stonehenge, but serving a similar ritual purpose. Even though nobody really knows the purpose or structure of Woodhenge beyond these post holes, what they do know is how old it is and when it was last used, thanks to pottery. And the grisly discovery in the very center of the site indicates the original purpose of Woodhenge was almost certainly for religious rituals of some kind. Scientists excavating the site found the body of a 3-year-old child, its skull split open by an ax, probably in an act of human sacrifice. Woodhenge is at the heart of a major religious landscape that includes Stonehenge, to which it is probably related in some way. Durrington Walls: An encampment site that partly overlaps Woodhenge, where people attending rituals in the area lived for part of the year. Excavations indicate it was a place of feasting and the kind of animal bones uncovered even show hints of the time of year. The dig at Durrington Walls is shedding a great deal of new light on Stonehenge. People gathered and feasted at the site as much as 4,500 years ago. At one time as many as 2,000 people would have camped at Durrington Walls, and that was at a time when the population of the entire island of Britain was scarcely 10,000 people. The National Trust has plotted a cross-country walk between Neolithic centers at this site. Silbury Hill: The largest prehistoric, manmade mound in Europe. At nearly 100 feet high and 525 feet in circumference, it is bigger than the Pyramids. Its presence on a relatively flat area of countryside is sudden and startling. The hill has never been satisfactorily excavated, and its purpose remains an enduring mystery. It's about 15 miles from Woodhenge on the edge of another Neolithic hub, Avebury. Avebury: One of the largest Neolithic and most complex ceremonial landscapes in Britain, the Avebury site includes a stone circle that partly wraps around a village, processional avenues of stone monuments, a circular henge of banks and ditches, and a museum about the marmalade heir, archaeologist Alexander Keiller, who not only bought the site to save it, but also conducted scholarly excavations there. When: This site, as well as all the other outdoor sites mentioned here, is open year round and can be visited at any reasonable hour. For more information, visit the English Heritage Woodhenge website. Amesbury and nearby Salisbury are at the center of the Novichok poisoning investigations. In March 2018, Sergei Skripal and his daughter Yulia were poisoned by a Russian nerve agent and survived. In July, two others were accidentally poisoned, possibly from handing a discarded perfume bottle that had contained the Novichok. One of them, British woman Dawn Sturgess, subsequently died. Investigations about the source of the poison are still ongoing. Until all the information is in, it is probably wise to use extreme caution about touching any found objects in this area. Families with young children who might be tempted to handle shiny objects and small bottles should probably avoid the area for now.